Paris Lights Up the New Year! 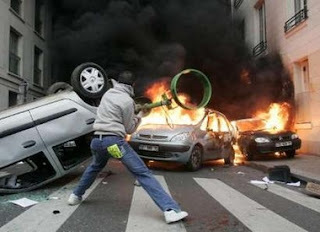 Fireworks and Torched Cars light up the Parisian skies! But, only 400 cars were torched this year… And, no trains! The French are getting so touchy about these statistics that they are “breaking out” a separate category of torched cars as in “cars accidentally exploding because they were too close to cars that were intentionally torched. VANDALS set fire to about 400 cars overnight and police said they arrested more than 250 people, as violence marred France’s New Year celebrations. However, a police spokesman said there were fewer problems than in 2005, when youths attacked trains in the Paris region and southeast of the country. 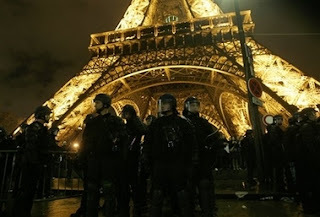 25,000 police were on duty throughout the country during the night, including 4500 in Paris, where the authorities banned fireworks and firecrackers. Police said that they had arrested 258 people nationwide by early morning, including two children aged eight and 10 who set fire to dustbins in the eastern city of Strasbourg. Three children aged between 10 and 12 were arrested in a Paris suburb after they were caught carrying cans of petrol. In the capital itself, almost 400,000 people welcomed in the New Year on the Champs Elysees and at the foot of the Eiffel Tower, where no serious incidents were reported. 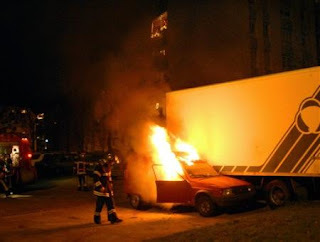 Setting cars on fire has become a regular event in France during New Year’s Eve celebrations, especially in the deprived suburbs that ring many cities. Tim Blair notes France is now exporting flames.